Happy Friday and today I wrapped up the end of my 10th week on air with the new business/entrepreneurial formatted show – That Business Show with Jamie Meloni. It’s been an amazing 10 weeks and I’ve met so many fascinating and influential people and today was no different. At the top of the hour, I spoke with Sarah Doering, Founder of Simplicity Organizing Solutions. Sarah holds a bachelors degree in Entrepreneurship and Finance and is certified with the National Association of Professional Organizers (NAPO) and her idea for the business grew out of her Nanny operation where she saw many homes in need of help with organization. Her goal is to help people live a stress-free and efficient lifestyle and through proper home organization as well as within the professional space, she is able to help reduce some of the daily stresses that we incur. Sarah’s services include residential and professional organizing as well as assistance with pre/post moving operations. She assists with shopping for items necessary to complete an effective organization and offers assistance and guidance in trash removal and donation. Learn more about Sarah at http://www.sorganizing.com and contact her directly at 813-500-0470 or email at sarah@sorganizing.com! 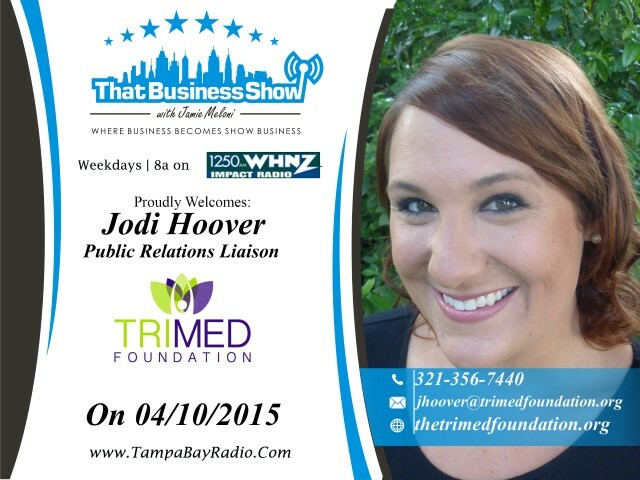 On the 2nd half of the show, I spoke with Jodi Hoover, Foundation Director and Public Relations Liaison with TriMed Foundation. She was joined in studio with Carrie Gant, Director of Oversight within the organization. Launched in the Fall of 2013, TriMed, assists patients with co-pays for their pharmaceutical needs through this 501(c)3. Patients that feel they need assistance can apply online at their website http://www.thetrimedfoundation.org. The organization was founded with the idea that patients receive a no interruption in therapy through full patient assistance and empowerment of their patients. To raise awareness and funds for the organization, TriMed hosts and is involved in a number of Fun-draisers throughout the year. The TriMed Foundation (along with the American Cancer Society) was selected to be a recipient of the Trinity Pharma Group Charity Golf Tournament. It will be held on May 30th at Innisbrook Resort & Golf Club on the Island Course. They still have a few sponsorship packages left, and you can register a four-some at www.TPGCharityGolf.com. Learn more about this influential organization making a difference in our community by visiting their website and consider making a donation to support their initiatives. Learn more at http://www.thetrimedfoundation.org or contact Jodi at 321-356-7440 or email at jhoover@trimedfoundation.org!